Do you work in a Leicester school that caters to 11-16 year olds? I am looking to work with school staff who engage with Secondary age learners, though the school itself may also cater to other age ranges (e.g. 4-19). Do you work in a role that directly supports learning? I am looking to work with senior leadership with a teaching role, teachers, classroom assistants, specialist provision and library staff. Have you, at some point in your career, had an experience of professional learning that related to your use of technology? 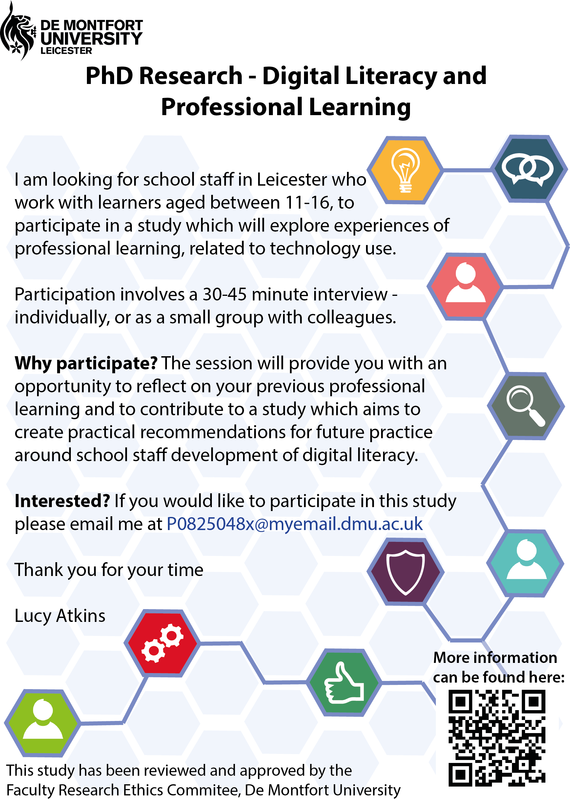 Then please consider participating in my PhD research – which aims to investigate how current professional development strategies impact on the development of staff digital literacy. “Digital Literacy refers to the skills, attitudes and knowledge required by educators to support learning in a digitally-rich world.